Texas, also known as the Lone Star State, is the second largest state in the United States as well as the second most populous. 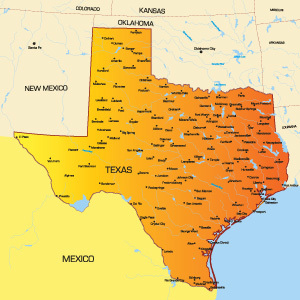 The bordering states are New Mexico, Oklahoma, Arkansas and Louisiana. Mexico also shares a border with Texas. The capital city is Austin but the largest city is Houston, which has a population of just over 2 million people. The major highways servicing Texans are The Gulf Freeway, I-35, I-10 and I-45. There are 730 airports in Texas which includes Dallas-Fort Worth International Airport and the George Bus Intercontinental Airport. Notable universities in the state are Rice University, Texas A&M University and The University of Texas. Attractions like Chillifest, the Houston Grand Opera, and Modern Art Museum of Fort Worth draw tourist from across the country.